I'm sure many of you are familiar with the friendly face of Aunty Cookie (as seen on her blog, www.auntycookie.com). Aunty Cookie is in fact Melbourne designer Shannon Lamden, who specialises in fabric design and illustration. Her product range includes hand-printed fabrics, bags, softies, original drawings, one of a kind fabric bunting and limited edition fabric craft panels. The versatile fabric Craft Panels measure 75cm x 75cm and feature various character poses and squares of patterns - perfect for quilting, appliques and a multitude of crafty projects just waiting to leap out of your imagination. 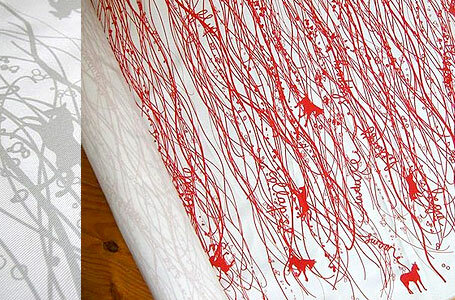 The fabric is a 200gsm cotton drill and has been hand screen printed using environmentally friendly inks. I love Shannon's distinctive drawing style & the expression on her characters' faces. The simplified lines work so well with the patterned areas (which are also picked up in the funky outfits worn by the cookie people). Originally available in black on white or cherry on white, the Craft Panels are also now available in a blue colourway. 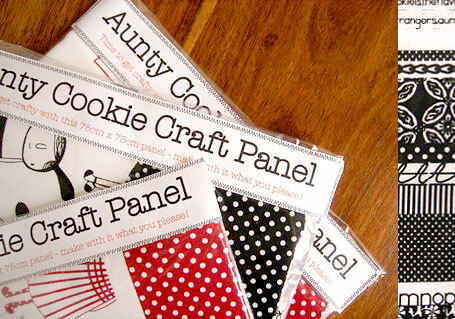 Each panel is US $28, and as Shannon says, "This Crafters Panel is limited edition so what are you waiting for?". If you're looking to make a larger piece, there are another two eye-catching prints currently available for purchase by the metre. (These are sold per 50cm/20" length for US $15. Fabric measures approx. 750mm wide, with the printed area measuring 700mm wide.) Pictured above is "Trinkets" which is available in fire engine red on white or light grey on white. 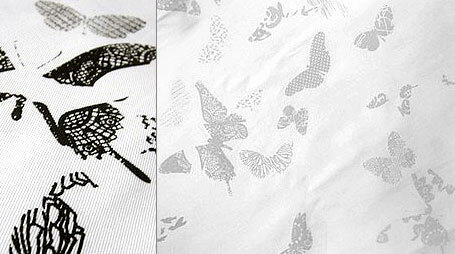 "Butterflies" is pictured below, and is available in black on white or light grey on white. I love the subtlety of the grey prints, but I also love the contrast in the black & red... I just can't decide which is my favourite! Once again, these prints are limited edition & really something special. As well as being stocked at Patchwork on Central Park, Arthurs Circus, Cocoon, Meet me at Mikes, Duckcloth and One Small Room, Aunty Cookie has clocked up over 500 sales through her Etsy store! No doubt, many of you have you have taken to the sewing machine with your own length of Aunty Cookie fabric - let us know if you've made something you'd like to show off! P.S. I'm also looking forward to seeing Shannon's new designs which will be released in March - stay tuned for more!